Do you know what a Taco Truck is? Do you know how many Taco Trucks are in Columbus? Do you know how good the food is at some of these trucks? During this past winter a noble undertaking was begun to find out the answers to these questions. 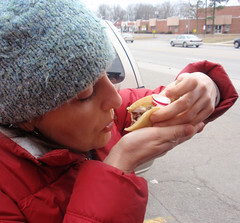 Several intrepid souls braved rain, extreme cold, language barriers, the threat of morbid obesity from testing out multiple tacos at multiple trucks in a day, snow and the wild, wild west side. It became a true odyssey, an obsession to find all of the trucks in Columbus. The chase was on. In some cases there was good information on the exact location of a truck. Other times things were more vague. A post on Columbus Underground helped get a few good leads. There were also some fruitless searches, a Bermuda Triangle of non working trucks on Cleveland Ave and a failed expedition to Delaware looking for a truck that was last seen in 2007. The next step was locating the trucks, figuring out hours and offerings as well as asking all kinds of questions in Spanish, English, Spanglish and a caveman style sign language. 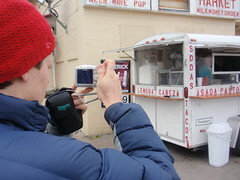 If you own a Taco Truck / Trailer when someone is asking a lot of questions and taking photos…you might get a bit nervous about what these loco people are doing. Unfortunately obsessive bloggers is not easy to translate into Spanish. These hurdles were overcome and the results were tasty. A whole world of meats were opened up like a can of ….Lengua (tongue). In addition to the standard steak (carne) and pork (carnitas), there is Tripa (Tripe), Cabeza (head as in cow or pig) and so on. 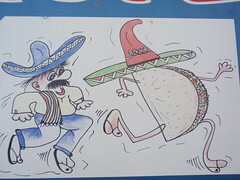 The menus included mixes of tacos, tortas, tostadas, tostones and all types of tortilla filled goodies. The menus at these trucks are extensive and diverse. All have tacos but there are definite differences in the offerings depending on where the owners come from – some have sopes, others have huaraches. 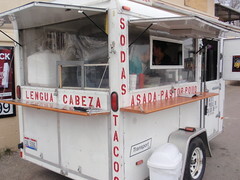 Exploring the variety of other cuisines is rewarding – these trucks offer items never seen on local Mexican restaurant menus. 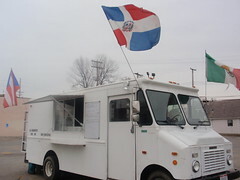 Most trucks also offer one or two special dishes on the weekends such as shrimp cocktail, seafood stew, goat stew and so on. Visiting a truck is going to take most people out of their culinary comfort zones and probably their surburban comfort zones as well. 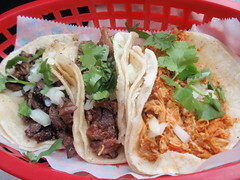 The journey for Latino comfort food leads to parts of town most people pass over on a freeway. Many of these street food vendors are located in the Taco Truck Triangle of the West Side – bordered by Georgesville Road, West Broad Street and Sullivant Ave – areas that saw the recession before anyone else did. The food is worth the effort. Many of the cooks inside the trucks are among the most kind and friendly people you can meet while trying out new meats. Do you know what a Taco Truck is? Do you know how many Taco Trucks are in Columbus? Do you know how good the food is at some of these trucks? This entry was posted on March 19, 2009 at 1:55 AM	and is filed under Columbus, culinary knowledge, Road Trip, sandwiches. 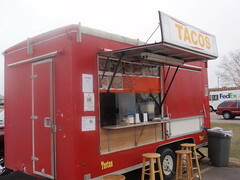 Tagged: taco trucks, tacotruckscolumbus.com. You can follow any responses to this entry through the RSS 2.0 feed. You can leave a response, or trackback from your own site. I just wiped a bit of drool off my keyboard. I recently moved to Columbus from Los Angeles. In Los Angeles, taco trucks are on every other corner, and they are all pretty good. I am of Mexican parents and I know a thing or two about mexican food, obviously. Since moving here, I have been in search of a good, homemade tasting, taco. I visited Taco Nazo last night and was blown away. It was like being in grandma’s kitchen. The food was wonderful and the service was great. My compliments to Quicho, the cook. Can’t wait to sample some more trucks! !